TFWM: Edge-blending technology seems to be coming up more and more from the video projection market. Will this become a standard in environments where projection is being used? Peter Taylor: Edge blending allows for different capabilities. From reducing throw distance requirements by using multiple projectors instead of one, to producing 16:9 aspect ratio images for on-stage productions using two 4:3 aspect ratio projectors, or to increase the pixel count to make the projected image appear less pixilated, edge blending can be a very useful capability. Currently, the major use is for productions such as Easter, Christmas, or other special occasions, where full stage shots or large images have to be produced with limited rear projection space available. I believe that moving forward, edge blending will also allow for more aesthetically pleasing House of Worship designs, such as a single canvas (curved or flat) with IMAG windows on message-reinforcing backgrounds. Ricardo A. Chen: Edge blending is used more and more today to create video walls. Combining several projectors allows the user to offer a higher resolution output. As the demand for HD increases, we will see either a greater need for high-resolution projectors with high brightness, or more projectors being put together for Edge Blending. Ernie Rodriguez: Edge-blending is an interesting technology which will find a niche market in projection. It takes some fairly sophisticated and somewhat expensive software and hardware solutions to allow images from multiple projectors to be “fused” together into a seamless visual experience. I don’t believe this technology will become a “standard” in normal projection applications, but it certainly allows projectors the capability of entering the Digital Signage and training/simulation industry. 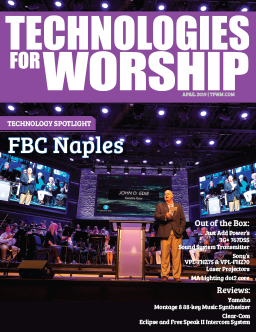 Jay Delp: I do believe we will be seeing more and more edge-blending projection technology especially as mid-size and larger congregations seek to take their projection impact to the next level. Edge-blending opens up a wider variety of creative projection applications especially for those houses of worship which have the budget, vision and space. George Tsintzouras: Edge-blending is a key technology requirement in producing wide aspect ratio, high-impact displays. We see the success that large visual canvases have in the entertainment world becoming a standard requirement in some of the other market spaces, especially in worship where message impact is paramount. The key to successful wide-format installations will be having projection systems that can quickly, reliably and easily blend into large 3:1 and 4:1 mega-pixel canvases, as well as having the intuitive system hardware and software to control them. TFWM: What effect (if any) is the Digital Signage industry having on the video projection industry? Taylor: Signal distribution and content delivery have been benefits to the projection industry, though in a limited applied way. 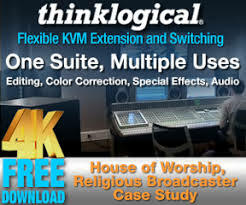 An application, for example in the House of Worship market would be where a recording has occurred in the main worship auditorium and the content is distributed via, for example, streaming video to classrooms or remote venues. Support messaging, be it PowerPoint or hymnals can also be sent over the network. Digital signage has also meant that for those projector companies that want to address this market, rugged and reliable projectors are required — together with a lower cost of ownership. DS systems typically operate 14 hours plus a day. As such, manufacturers have to design reliability into their products. All users can benefit from reliability and lower costs. Chen: Digital signage is a different market than the typical use of a video projector. Most projectors today are used to display content for business or event purposes. Digital Signage is a growing market as people feel the need to deliver video content for advertisement instead of simple static images. Canon’s REALiS Multimedia Projectors are an ideal fit for the digital signage market because of the high resolution and brightness in a compact, lightweight package. Rodriguez: The Digital Signage market has been emerging for years, but only in the last few is the content software getting optimized for efficient performance. What I believe it has done to the video projection industry is effectively integrate the firmware (managing the content) and hardware (display device) into a more seamless solution to the end customer. Also, the ability to show large, high resolution images from a very short distance is an enabling technology that will energize this industry even further. Space is a premium in the digital signage market, and getting a large image from close proximity is an optimal solution. The key will be attaining a large image (60+ diag) and user-friendly content software, at a competitive price. Delp: For the most part these two technologies continue to address two different and separate markets and solutions and I believe will continue to do so for the forseeable future. But as Digital Signage become more affordable (in larger formats/screen sizes) it will begin to make inroads (slowly) into the projection market especially where ambient light (primarily outdoors) is substantial. Tsintzouras: We feel that the Digital Signage market is a distinct segment that is part of the projection market. Primarily in the retail and entertainment market segment, digital signage products are used to accomplish the same results: message transmission for the purpose of retention, and of course sales. Thus digital signage and projection have many symbiotic traits and are linked. With less than 60” displays typically being flat panels, projection and LED cover the larger screen and brightness requirements of that industry, and so as the digital signage market grows, it helps to grow the projection market. TFWM: What are some of the most creative applications of projection technology you have seen used in a house of worship? Taylor: It never ceases to amaze me at the creativeness of Technical Directors. They’re creatively using today’s tools like the Barco Encore image processors that allow for immersive, relevant, and retentive message delivery and/or creating environments. Feature sets within the projectors can also aid bringing the imagination of the production staff to life, like edge blending and image warping. I have seen the décor in a large church change in a few hours by projecting relevant “wallpaper” (the Baptistery was even superimposed on to the new wallpaper, but the pillars remained intact), to projection onto round screens, to delivering 3D children’s ministry messages, to creating a new and constantly changing environment. Chen: Projectors have been used in the past to display ‘image magnification,’ scripture, and lyrics. Increasingly, we see projectors being used to add video content to songs (almost like a music video or karaoke), which makes it easy and fun for the audience to participate. Rodriguez: The worship market is experiencing an evolution in information (analog to digital) sharing. A growing market which is in need of three key solutions: 1) large image sizes, 2) flexibility in the image size & positioning, and 3) integration of good audio systems. I believe that a recent audio/visual research firm survey showed that over 60% of churches are looking to purchase and expand upon their projection systems. One of the most recent applications that have intrigued me are the use of two large (100+ diag) rear projection systems with the audio system built in to the perimeter of the actual screen frame. Delp: There are several but I liked how one church combined “live” acting with projected dramatic video clips to their Christmas presentation. The “play” began with real actors in the sanctuary then transitioned (continued) on the screen. It was a very effective way to communicate the Christmas story as it combined new technologies with a familiar format (live drama). Tsintzouras: Recently Christie acquired Vista Systems, makers of the world famous, multi-windowing processor the Spyder. With Christie projectors and Spyder systems, the Cornerstone Christian Fellowship (Chandler, Az) now has a cutting-edge graphics system display. With 4 projectors on the main screen making a 36×19 video wall, the entire church’s stage area is one big visual canvas. Add to that left and right 16×9 satellite screens, a control room that mirrors what’s shown on the projectors and IMAG, DVD and videotape sources, this church is a shining example of a high-impact, multi-sensory worship experience. TFWM: Are you finding that more churches are making accommodations for HD formats with their implementation of projection equipment? Taylor: In the medium to large churches, as the price of HD continues to decline, there is a rapidly accelerating HD adoption rate. For Image Magnification shots, HD, especially 1080, delivers a life like image. In fact, one leading Senior Pastor, when seeing his IMAG shot on a 24’ wide HD1080 screen, immediately turned around and said he would need a make-up artist! I believe for remote venues, where the virtual Pastor is delivering the message, HD is a definite requirement. Together with DLP technology, this really produces the realistic life-like image. For venues that have very large screens, the pixel count that HD1080 provides is also a major benefit. For example, if a screen is 30’ wide and an XGA projector is used, this translates to under 2.8 pixels per inch. That does not allow for a realistic image. For the right reasons, HD does make a great impression. Chen: More churches everyday are including multimedia presentations into their services. High Definition content is definitely something that the industry is gravitating towards. High Definition image acquisition is a must these days, and the need to display such high definition content requires HD-capable projectors. Canon’s REALiS line of multimedia projectors offer resolutions high enough to display uncompressed 720P HD content and at the same time provides the brightness that people need for display screen sizes of up to 300-inches. Rodriguez: The HD “buzz” has certainly influenced some of the buyers for the church video projection equipment. Having said that, I believe there is a greater need for a more versatile projection system (such as WXGA), where the flexibility of showing XGA 4:3 media (such as .ppt) and HD content (such as 720p) allows for the most comprehensive solution. Viewing large images (70+ diag) from an estimated distance of say, 15-20ft minimum becomes irrelevant for true high HD content. The cost of HD equipment (i.e. cameras, video boards, etc) requires larger budgets, which are sometimes more difficult for churches to obtain. Delp: I’m finding many churches laying the foundation for possible HD content by installation of 16×9 screens and cameras/camcorders that can shoot in both SD and HD but HD projection, recording and distribution is coming much slower. Projecting and recording in HD is nice but I don’t believe we will see it taking place in most churches for another 5-10 years. It’s simply too expensive and “overkill” for most non-broadcasting ministries. 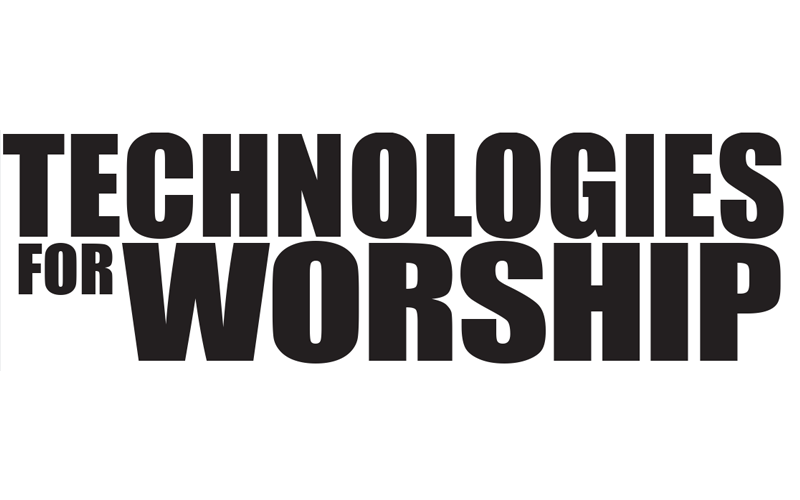 Tsintzouras: From an investment standpoint, installations across all market segments, including worship, are trying to accommodate for future technologies so they can get the most return on their investment. The industry-coined phrase for this is ‘future proofing’ and it generally involves weighing the costs of upgrading the video infrastructure all at once, or over time in a piece-meal fashion. From the projection end, we see the dilemma that most people have with the two HD formats (720p, 1080p) but feel that generally the decision factor isn’t based on source content resolution but rather projector brightness. A 1080p projector tends to be brighter than a 720p simply based on the larger sized optics it has. TFWM: What is the future of video projection as you see it? Chen: Projectors used for video display will definitely have to be High Definition, as more users are demanding higher quality video. The prices for projectors capable of displaying native high-resolution content such as HD video are still a bit high but, with volume increases due to market demand, will surely change in the near future. Rodriguez: Ahh, the famous “loaded” question. From my perspective, I believe that this industry is looking for a unique differentiator to sustain its growth. 3M has developed a unique patented short throw/extreme-off-axis technology termed Vikuiti(tm) Super Close Projection. This entails an optical solution that produces large, crisp images from extremely short distances for various markets/applications. This technology is gaining incredible traction in education and business today. Digital Signage and Entertainment products are now emerging. Other unique products will follow. Finally, two key survivors in the video/data projection market in my opinion: 1) Large area LCD’s, and 2) Super Close Projection will re-energize and transform the market as we move forward. Taylor: Video projection has become a main stay in many churches and is spreading out amongst more denominations. For the same reason that every University, most colleges, high schools and even elementary schools employ projection to enhance the retentiveness and learning capability of their students, churches are using projection for primarily the same reasons. Other main reasons include the need to create a new and refreshing environment, and the need to have worshipers in the back row of the seats feel that they are part of the experience. These reasons won’t change. The younger generation is video savvy and therefore embraces and expects video in their learning experience. Tsintzouras: Simple, small, low-lumen projectors are becoming ubiquitous in our world. Soon you will see small projectors attached to iPods. Very exciting. As we continue to innovate, we also find that with professional video projection systems, the future has never been brighter. (Pardon the pun) However, rather than lumens and resolution being the main focal points, the future will be based on systems and how seamless the projector integrates with the total command, control and signal solution of the installation. Delp: Aside from the projection’s perpetual brighter-cheaper-smaller-better advancements I see a projection future that provides wireless video solutions (at acceptable resolutions! ), moving projectors (not unlike today’s moving lights), and a much more creative and broader use of non-rectangular screen sizes, shapes and surfaces. And I sure hope I/we “see” a major drop in the text-based vs. image-based projection ratio. Come on, folks this is video projection as a visual medium, not an electronic overhead projector!